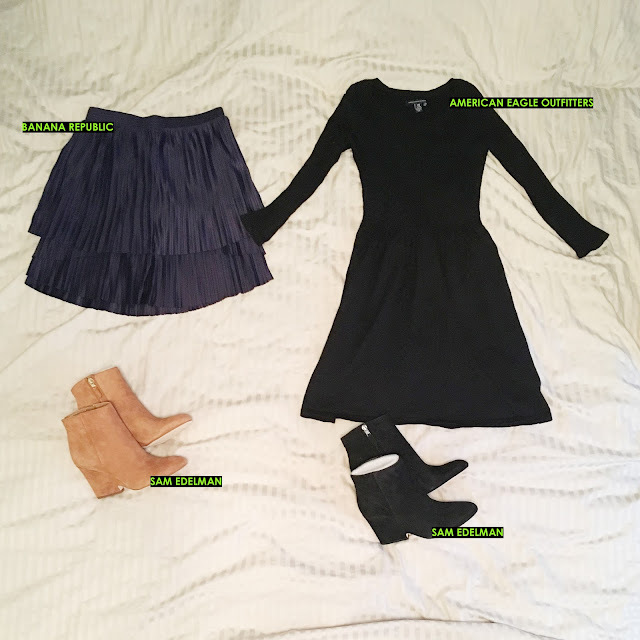 Above is what I purchased in the month of January, which includes this pretty Layered Pleated Skirt from Banana Republic. Blazer: H&M (old but similar here). Tank: H&M Jersey Tank. Skirt: Banana Republic Layered Pleated Skirt in 00P. I absolutely love how comfy and stylish the Sam Edelman Wilson booties look so got them in both Black and Saddle Suede. 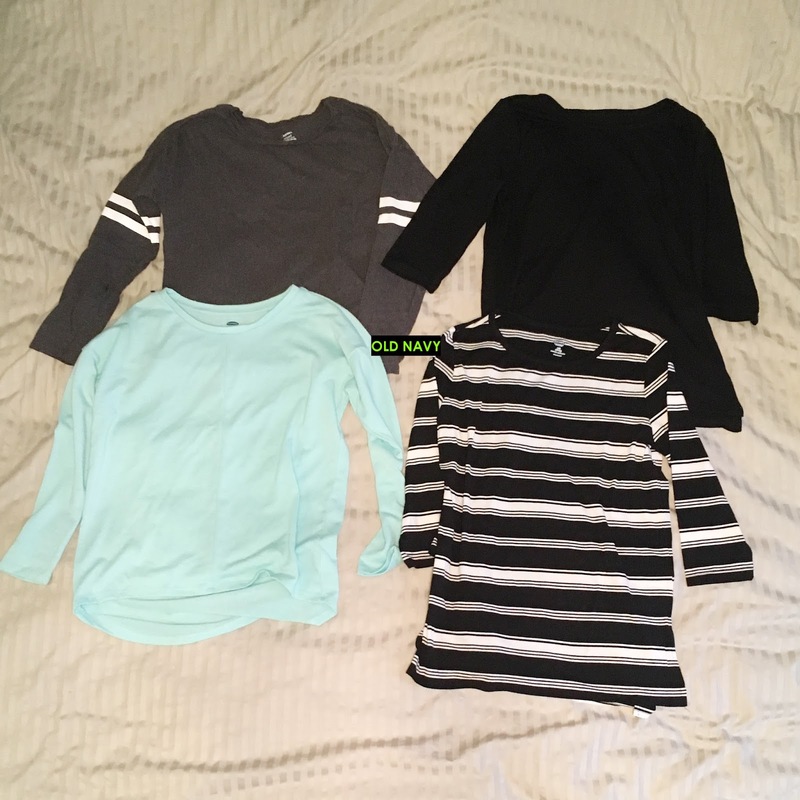 I also picked up a Textured Fit & Flare Sweater Dress from American Eagle Outfitters that I found while shopping in Las Vegas a few weeks ago and a few long-sleeved girls tees that I picked up in Old Navy. I went in store, which I rarely do, to make a return, and ended up buying a large amount of long sleeve tees and baby clothes since they were all either $0.97 or $1.97, which I thought was a crazy good price! 1/3 of what I purchased! 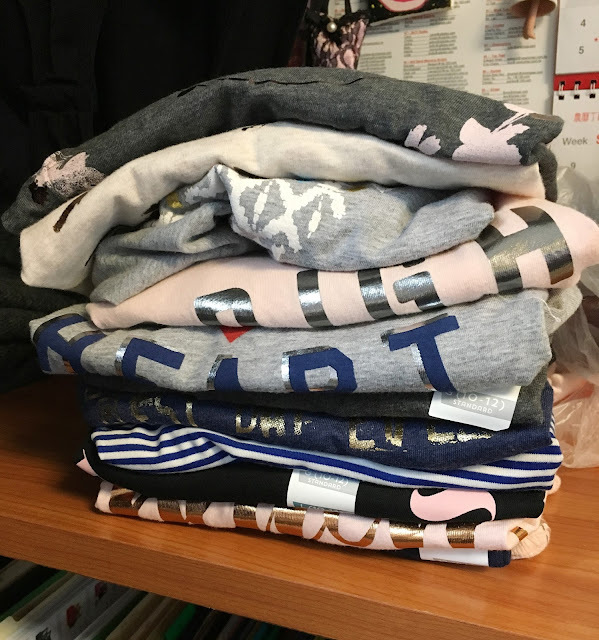 My sister confirmed it so I picked up almost every single shirt I could find on sale for my nieces and also a few for baby A and me to match - I can't resist mommy and me clothes! The register lady probably thought I was crazy because I ended up seeing her 3x because I kept finding more stuff to get! Trying them on for my sister's reference. These were a bit snug on me and are girl's size L (10/12). Other ones that I purchased and are shown online are here, here, and here. Skirt: Banana Republic Layered Pleated Skirt in 00P. Booties: Nine West (similar here). 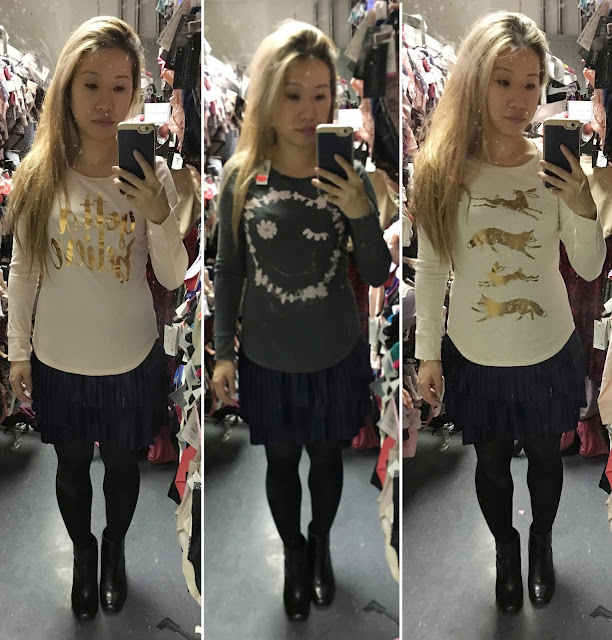 Note that these shirts are all $6-8 online but are just $0.97-$1.97 in store, though I'm not sure if it's only the store I went to in NYC. 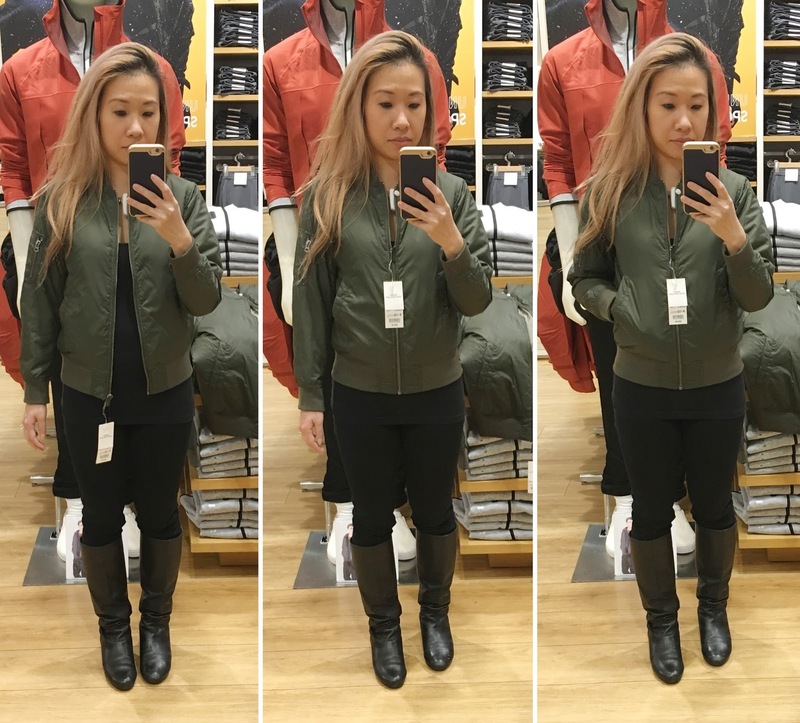 I also went to Uniqlo to make a return and ended up buying and then returning a cute olive green bomber jacket, which I've noticed is really trending right now. I initially wanted it to match with A but he didn't want it so back both went. Jacket: Uniqlo Mens MA-1 Bomber Jacket. 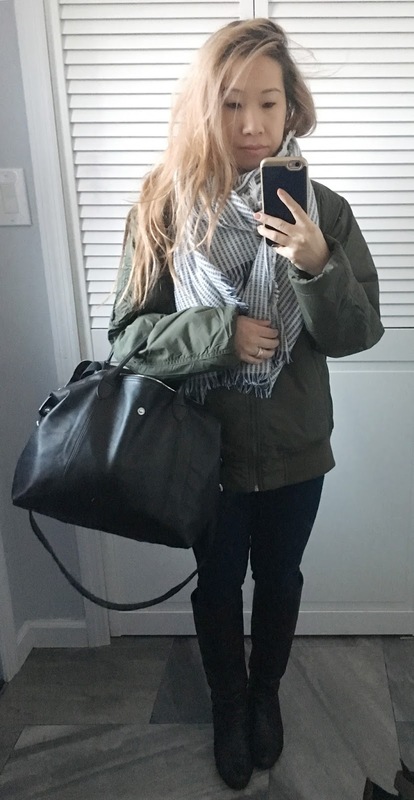 Scarf: LOFT Mixed Stripe Scarf. Bag: Longchamp 'Le Pliage Cuir' Medium Leather Handbag.